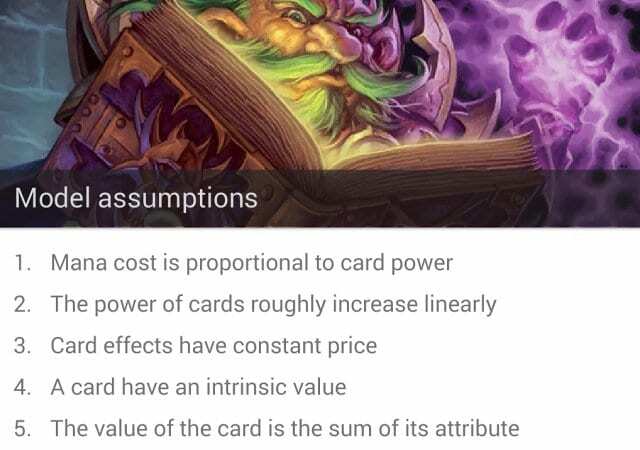 Elie Bursztein now looks into the attributes for each card in Hearthstone, providing a few simple examples of value discrepancy for some of the common ones. What makes this game so interesting is the cards. Everything is a card, and you should look at how the game is structured. Actually, your hero is a card. And the card is the thing we are going to look at in depth in this first part. A card – a Minion here, the Yeti – has 4 attributes (see right-hand image). The first one is the ‘mana’, which is the cost you pay to play the card: as I said, from 0 to 10. And then you have the basic attribute in this card, which is ‘attack’, 4 here. And there’s ‘health’ – 5. So, that’s a card, and this is a very boring card, nothing special with this card. What makes the game fun is that there are lots of cards which have a lot of interesting effects. These (see right-hand image) are 3 of my favorite cards: VanCleef, the Faerie Dragon and the Cabal Shadow Priest. And what’s very interesting is you can combine all those effects and do unintended or very special combo, and that’s basically how you win the game. So, finding good synergy between cards is one of the fun aspects of the game. So, now that we know cards, the question is whether there are better cards that have a better bang for the buck than others. How do we find those? Well, I started with a theory. We are going to start this with a basic assumption of how we are going to model this. The first thing is: the mana cost is proportional to the card power, which means that if you play a 1-mana card it’s less powerful than a 2-mana card which is less powerful than a 3-mana card. If it weren’t like that, the game would be broken because everyone would play just the most powerful thing, which is 1, and overrun people. Another assumption is: the power of the cards roughly increases linearly, which means a 2-mana card is roughly twice as powerful as a 1-mana card. If this hypothesis were not true, some players would have no chance of success. So, roughly, the linear is something you need to be able to have the game balance between short-term and long-term. It’s not quite linear, but it’s a reasonable assumption. Finding good synergy between cards is one of the fun aspects of the game. Card effects have a constant price. It means that the Divine Shield or any effect has the same price regardless of the card it’s in. So there is no discount for specific cards, there is no secret, which brings us to the fourth assumption: having a card has value. Remember, you only get one card each turn, so even holding a card has some value, which we call the intrinsic value of the card. And finally, we believe there is no secret. 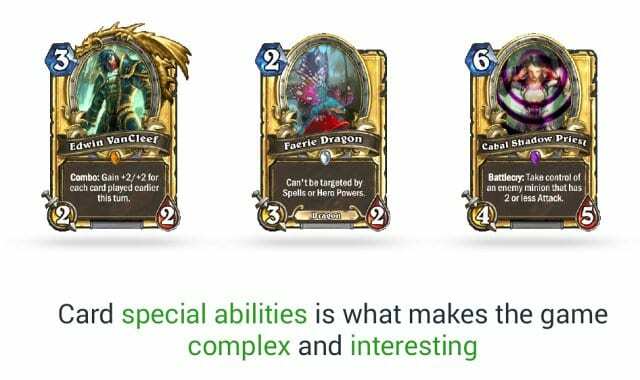 We believe Blizzard has no hidden component, hidden balancing factor, and what you have in the card is exactly what the value of the card should be. So if you sum all the attributes, you will get the value of the card. How you sum them is another question we are going to explore, but there is nothing secret about it, and we believe everything is in the game and you can actually look at it. That’s where we start. So, how do we model a card? Well, as I said, the mana is the price, and the price is equal to the attack and the health and the intrinsic value of my Yeti (see right-hand image). There’s nothing else on the card, so we assume that the price of the mana is exactly the sum of those attributes. 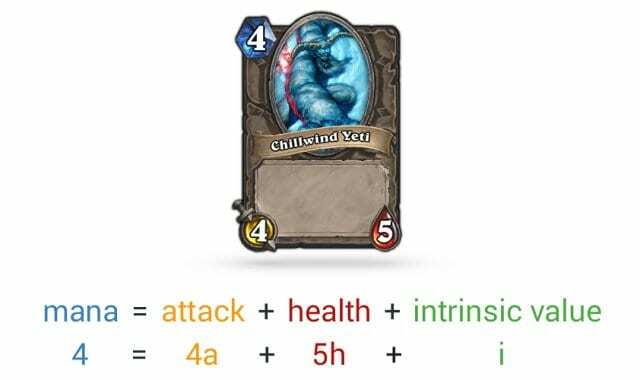 You put it into a linear function – don’t worry, it’s very simple – and you say, well, 4 mana is 4 attacks, where ‘a’ is basically what we call the ‘attack coefficient’, which is the base point, how much mana it costs to have 1 attack. Plus 5 health, where ‘h’ is the coefficient for health, which is the base point, how much 1 health point costs in mana. Plus ‘i’, which is the intrinsic value of the card, that is, how much mana it costs to even hold a card. With that, without looking at the coefficients just yet, you can compare 2 cards (see right-hand image). Let’s take a very common card, the Boulderfist Ogre, which is heavily played in Arena. 6 mana is 6 attacks, plus 7 health, plus the intrinsic value. 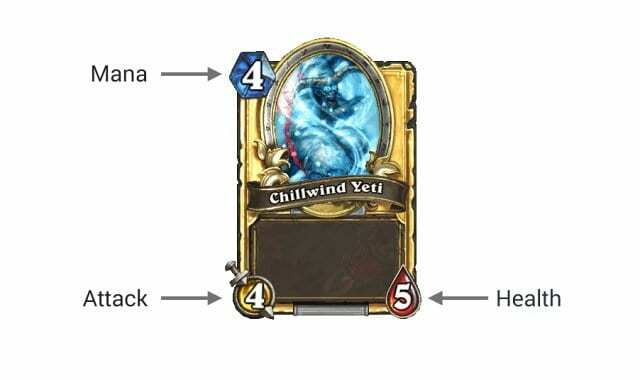 And we want to compare it to the Chillwind Yeti. It’s not really easy to compare, so we are going to be very-very hi-tech. We are going to go back to fourth grade and we are going to just divide by 6 – yes, that’s really hard, I know… And then it gives you 1 mana point. So, for 1 mana point you get 1 attack, 1.16 health, and the intrinsic value of the card. On the other hand, we are going to divide by 4. And by doing this, you just say, well, for 1 mana point what you get is 1 attack and 1.25 health, plus the intrinsic value. And in here you can immediately see that one of them gets a better bang for the buck. 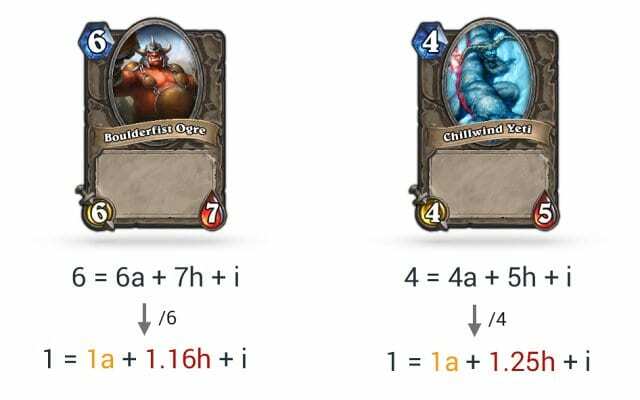 The Yeti gets more health points per mana point than the Boulderfist Ogre. That’s the kind of imbalance we are going to look for. Let me give you a more interesting example (see right-hand image). Fireball, my most hated card – I hate to be killed by a fireball. That’s a very simple thing; for those who don’t know what a Fireball is, it’s a big ball of fire that people shoot at you, and you die. That’s what it is. Basically, this one is very simple to model. You pay 4 mana, and you get 6 damage. So, very simple to model: 1 mana is 1.5 damage. A giant fireball is called the Pyroblast – bigger, stronger, meaner. The Pyroblast is 10 mana, and for 10 mana you get 10 damage. Well, okay, but then in that case it might be bigger but the value is not that great. You get 1 mana – 1 damage, and you can immediately see that’s not quite right. If you have 10 mana, you can play 2 Fireball and a half for the price of 1 Pyroblast. So the value of the Pyroblast is less interesting than that of the Fireball. What’s interesting is this is a new version of the Pyroblast. 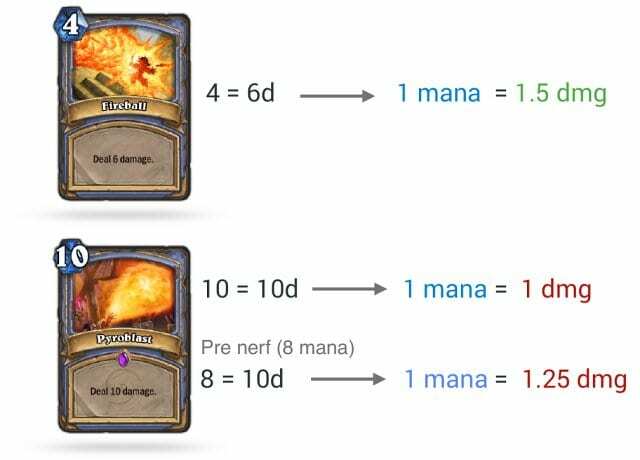 Earlier this year, we had a “pre nerf” version which used to cost 8 mana, where at that time the mana cost was even lower than the Fireball. Basically, before the adjusted value we get 1.25 damage for 1 mana. So, something is not right here, is it? Let’s compare the two (see right-hand image). 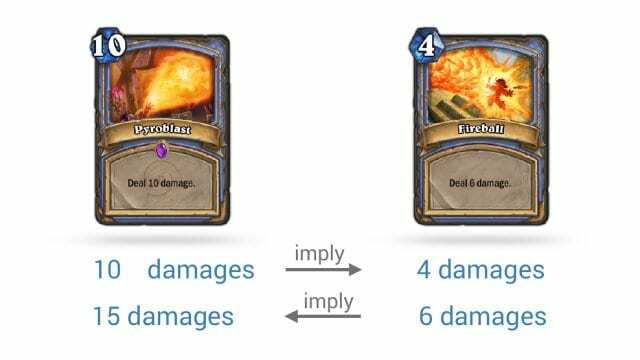 If you take 10 damage for Pyroblast, it implies that the Fireball should do 4 damage, not 6. And you’re like, well, okay, but the Fireball is properly priced, you should do 6 damage for 4. But in that case I want the Pyroblast to do 15 damage, not 10. Give me back my Pyroblast! So there’s an imbalance. Even if you look at simple coefficients, you can see that there are some decisions which you can debate. Of course we don’t have all the data that Blizzard has, and it’s probably based on statistical analysis. But there’s some sort of mismatching complexity that is the basic, core idea of finding undervalued cards.